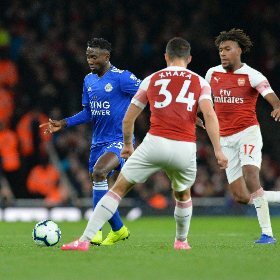 Wilfred Ndidi was understandably disappointed in the wake of Leicester City's 3-1 loss to Arsenal in a Premier League clash at the Emirates Stadium on Monday night and mentioned two incidents that would changed the outcome of the meeting. The Foxes were not awarded a penalty in the first half when Arsenal defender Rob Holding clearly handled the ball as he was challenging Ndidi for a header and the Super Eagles star missed a great opportunity to put his 2-1 up when his header hit the crossbar in the second half. Speaking to LCFC TV, Ndidi stated : ''I would say it’s a bit disappointing in the second half, we did our bit in the first half, we did really well. "It’s not just about looking at the first half, we need to develop the second half and go from there. It was a tight game. When we conceded the second and then the third, everything just didn’t go our way. "If we’d have got the penalty and then the ball hadn’t hit the crossbar everything would have worked perfectly for us. We just look forward and take confidence into the next game." Ndidi is among four Leicester City players to have started and gone the distance in all the nine matches played by the club in the Premier League this term.